Images via Reading and Leeds Festival. 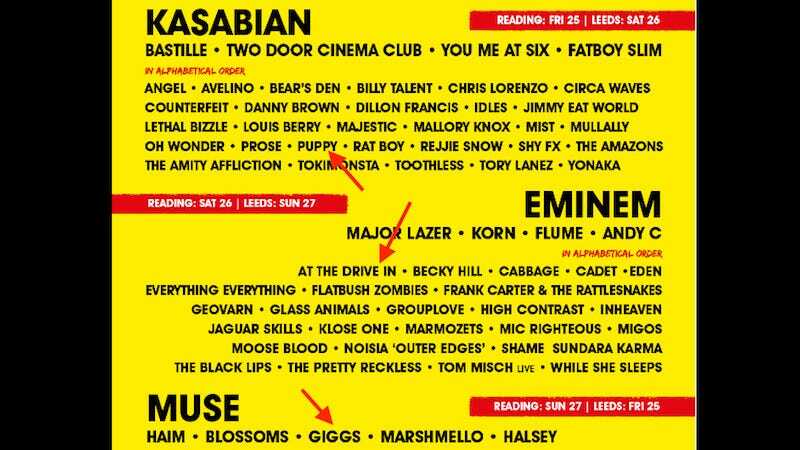 Rat Boy, Oh Wonder and Prose have been announced as acts on the lineup for the U.K.’s Reading and Leeds Festival in August. Also, You Me at Six, Angel, Avelino, Bear’s Den, the Amity Affliction and Giggs. And DAVE. Everything Everything. Billy Talent. Marshmello! Camelphat! Wiley! James Organ. In addition, Picture This! Prose! Puppy! Idles. Mist. Claptone. Joining them will be Yonaka, Counterfeit, Mostack, Tom Grennan, At the Drive In. While She Sleeps is also on the lineup, along with Tom Misch (Live), The Pretty Reckless, Moose Blood, Marmozets, Geovarn and Glass Animals. GroupLove will be there and so will High Contrast, Inheaven, Cabbage, Cadet and Halsey and many more.